If you’ve played a lot of blackjack, chances are you are familiar with the widespread Lucky Ladies bonus bet. 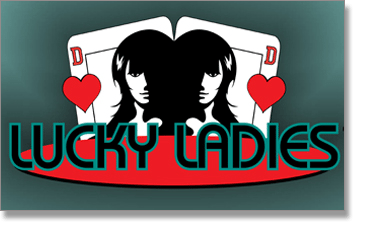 Lucky Ladies is a side bet available in most major casinos, placed in addition to the standard blackjack bet. It pays an added bonus based solely on your initial two cards. There are five possible winning outcomes of this side wager. The Lucky Ladies side bet is a wager made on the first two cards dealt; that they will total 20 points, in any combination. In games which offer this wager, there will be a designated area for such a bet, adjacent to the regular blackjack bet (usually a small, separate circle). A Lucky Ladies wager, like all side bets, has no association or influence on the main blackjack bet and is entirely based on our first two cards. All other rules which are relevant to the game being played are not affected by the Lucky Ladies wager. If we have placed the Lucky Ladies bet, we only receive a bonus payout if the sum of our first two cards are 20. If they do not total 21, we lose the side bet, but our main wager and the game continues. If dealt any two unsuited cards which total 20 points, this holds a payout of 4 to 1. Any suited cards totalling 20 is paid out at 9 to 1 odds. Any matching cards totalling 20 points (same rank and suit) holds a payout of 19 to 1. If we are dealt two Queens of Hearts, we receive a payout of 125 to 1. If we are dealt two Queens of Hearts and the dealer draws to blackjack, we are paid out 1000 to 1. The Lucky Ladies wager is a side bet with a high house edge of 24.71%, and should be made for pure enjoyment value rather than an expectation of consistent winnings. Hitting the coveted Queen or Hearts pair while the dealer simultaneously draws a blackjack is as good a chance as finding a needle in a really, really big haystack (0.0015%), while drawing to 20 with any two cards is around an eight per cent chance. But as with all side wagers, they are entertaining when played every now and then, and hopefully at some point in time, you’ll get some lovely lady luck on your side.